According to Tejvon Pettinger, author of an online article “Biography of Boudicca”, Boudicca was born in South East England during the year 30 A.D. Roughly eighteen years later, in 48 A.D. she was married to Prasutagus in Norfolk. Marrying him immediately made Boudicca Queen of Ancient Briton, of the Iceni people. The empire was semi-independent because they were essentially under Roman dominion. Boudicca grew vengeful and became determined to prevent anyone else to be hurt or continue to be hurt by the Roman soldiers. She obtained knowledge that nearby tribes were being mistreated similarly to the icenian people and she formed an alliance with them. As they began to grow in numbers, she became powerful, for she would be the one that would lead this massive army that had grown tired of all of the abuse. cloak fastened with a brooch.”(Pettinger). One of her main targets was the big roman city, Colchester and it was fairly easy because they lacked security. After various victories and showing no mercy to the romans, she and her army were off you meet Suetonious’s army, a roman governor and were successful in ambushing a column of roman soldiers. As they approached the open battle area, the roman army made their stance. The Briton army was indeed large in numbers however the romans were disciplined and skilled with their weapons. The method used by the romans that was ultimately the Britons’ downfall, was standing in a row with their shields in front of them tightly, almost creating a wall of protection. As the enemy gradually approached them, they would stab them with their swords. 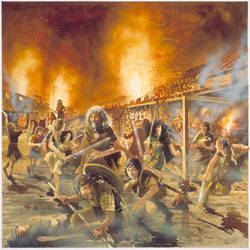 Ultimately, about 400 romans were killed as opposed to the 200,000 Britons that were killed in battle (Pettinger). Boudicca’s death in unknown, it is believed that she committed suicide by drinking poison or died from her battle wounds. Victorian Age, when Prince Albert, Queen Victoria’s husband took an interest and had a statue of her built in front of the Houses of Parliament in London (Pettinger). All of her efforts to remove the romans from England, made her a symbol of the British Empire. Women may fail, time and time again but the fact that they attempted to make a difference to the world leaves a footprint. 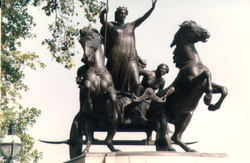 Boudicca may have fallen but no one could ever fill in her footprints, because she still managed to change the world.